Today, the Xbox One finally went on sale in Japan. The launch looked rather depressing. But maybe you saw that coming, right? Granted, these days, it's really hard to tell how hardware does. People can order stuff online, so there isn't the same emphasis on launch lines, like as in the past. That being said, if there are lots of people waiting for something—say, Yokai Watch toys—then it's possible to make a popularity assumption. But that is exactly what it is: an assumption. Still, the Xbox One launch in Japan looks like a total downer. I'm sure there are Japanese gamers excited to get it, and a few people did appear to line up for the console. But, man, these photos circulating online do not look good for the Xbox One's chances in Japan. Note that today is September 4 in Japan. As Japanese game site Inside pointed out, Xbox Japan held a special mid-night launch countdown event. Everyone seems so excited counting down to today. Look at all those people at the Xbox One live stream event! But as shown online, lots of people weren't exactly lining up for the console. This is Yodobashi-Akiba, an enormous electronics store in Tokyo geek district Akihabara. According to Twitter user DC, nobody is in line. 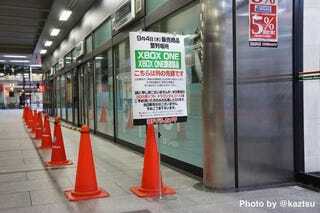 The sign marks the start of the Xbox One line for the Shinjuku Yodobashi Camera. According to Inside, the man in the background, playing a PS Vita, said he wasn't waiting for the Xbox One. Inside reports that, at this time, nobody was lined up for the console. According to Inside, nobody was at the Bic Camera in Tokyo's Shinjuku, either. This photo was taken at around midnight. Again, another shot of Yodobashi-Akiba. This was taken at around 1am. And here is Sofmap in Akihabara at around the same time. The red sign reads, "On sale today!" But wait! Here are people apparently buying Xbox One consoles at Yodobashi-Akiba. Oh, right, this is the guy that was hosting the official Xbox One launch livestream. However, the person with him supposedly was a live stream viewer who decided to come buy the Xbox One. At least, that's what Xbox Japan's official Twitter account says. Maybe this person was in line and just didn't appear in any photos. Who knows. This is Labi, a huge electronics store, in Tokyo's Ikebukuro. The above photo was taken at around 2am. It was empty. Twitter user Kaztsu uploaded this photo of Yodobashi-Akiba this morning. This is at 8am, but the top photo for this article is at around 6am. Same shop, but at around 8:09AM. The people on the right are going to work. The people on the left—oh, wait. There were fliers for the Xbox One. The Sofmap in Akihabara gave into to those lining up about when the Xbox One would be going on sale. So, you might think, well, this is a workday, so of course nobody is going to line up for stuff. Above is a line this morning of eleven people waiting to eat stewed cow tongue at a restaurant called Tankiyo. GameSpark, which co-hosted the Xbox One live stream with Inside, uploaded one of the only photos I've seen so far with people lined up for the Xbox One. This was taken at Yodobashi-Akiba. According to GameSpark, there were seven people lined up right before the door opened at 9:30am. Mainichi, however, uploaded a photo as well and reports that there were ten people in line. That's almost as many who waited for cow tongue! For comparison's sake, here's a photo Kaztsu took of when the PS4 went on sale at Yodobashi-Akiba. And here is a photo taken around noon at the Yodobashi-Akiba of the Xbox One launch event. Twitter user Unicorn described it as "quiet." This is the Yodobashi Camera in Shinjuku. Still, nobody is in line. Japanese consumers do buy foreign products, whether they are Apple hardware or German cars, when they think they're the best. For one reason or another, Microsoft was never able to convince people that the Xbox 360 was the best. Because of the lack of Japanese interest, that's perhaps why the Xbox One isn't getting nearly the push the Xbox 360 did. For instance, I don't recall seeing an Xbox One ad on Japanese television. The staggered release date, months behind the PS4's Japanese release, didn't help, either. Moreover, Japanese gamers who really, really wanted an Xbox One probably already imported one. And so, here we are. But! Like with anything, maybe the Xbox One will have a slow burn. Maybe people will swing by and pick up consoles during the day and throughout the week. The photos look sad, sure, but they only supplement the forthcoming sales figures. We'll know soon enough how those look.